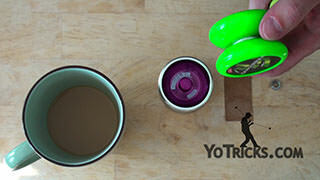 Use flowable silicone to add extra weight to the Dominator yo-yo. Add Weight to the Dominator Yoyo TrickIn this video I am going to teach you how to add a little bit of weight to the inside of your Dominators. Unlike the Luminators the Dominators are not setup in such a way that weight rings will really help you out a whole lot. What I have found is that you can actually use your flowable silicone which I have already shown you to make your brake pads work better and last longer. 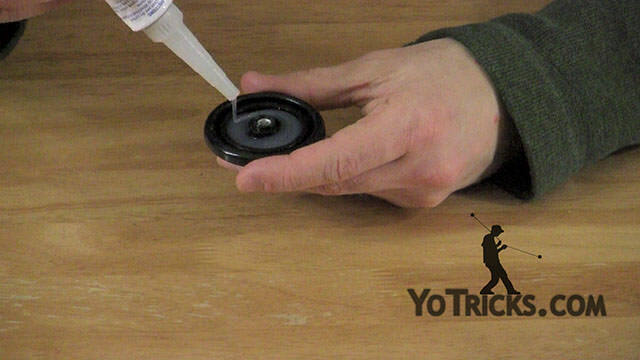 You can actually use that underneath the cap here to add a little bit of weight to the inside of the yo-yo. That is going to make the yo-yo a little bit more stable and help is sleep longer, which is really great for these. In order to do this the first thing you want to do is get your yo-yo and take it apart. In order to get this cap off it can be pretty difficult. The easiest way that I have found it to get my little yo-yo tool or a small screw driver. You want to stick the small screw driver end right in between the black plastic here and the cap. You are going to want to make sure that it goes down all the way. You want to be pretty careful when you are doing this. You have to press pretty hard. If you are young you may want to find an adult that can help you do this. I’ve stabbed myself and that is no way to do this. Make sure you press pretty hard, you may even need to wiggle it in a little bit until you feel that it has touched the bottom of the black plastic. Once you have gotten it in there you just have to bend and that cap pops right off. Once you have the cap off you can just take that and set it off to the side. I have already got my flowable silicone setup. I’ve got the applicator right on the top and, like I’ve told you in the other video, I have cut off some of these segments here with a pair of scissors to make the silicone come out a little bit faster which is a whole lot better… for me anyway. You are just going to take your silicone and you are going to squeeze it right into this inner area right here, right inside the yo-yo. You don’t need to be super concerned with getting it completely even because the flowable silicone does even itself out so just try to get it in there. Try to get it just on the inside of this recess here without making a huge mess. You want to fill it all the way up to the top. You don’t want it to leak over onto the other sides but you do want to fill it up as high as it can go because that is going to add the maximum amount of weight. Once you have got the yo-yo back together you may find that that is too much and you may want to add a little bit less. I would say for the first time try filling it all the way up. That is the way that I like to use these and it seems to really work well. Get it in there until you have filled it all the way to the top. You can check it out; that seems to be pretty good. While it is drying you want it to dry perfectly even. You want to make sure that you have a flat surface, but these bolts on the yo-yo, they do not come out. What I have done, is I decided just to get a couple of tape cases from the tapes I use to make these videos. I set the yo-yo right on top of it, just like that. That allows it to dry perfectly evenly as long as the table surface is already level. When you are done it is going to turn out looking like this. Again, it kind of looks the same as when you poured it. When you touch it you will see that it has that nice rubbery surface. It adds just the right amount of weight to the inside of the yo-yo. Once you’ve got that done you want to take your cap and put that right back on. Just flip it over, put it on, squeeze it down. That is how you add some weight using your silicone to the inside of your Dominator.